The old and new “Pamela May” canal boats. Passengers are invited to cruise the canal whilst enjoying a specially prepared cream tea. Cream tea trips leave Vines Park at 2 pm and last three hours. Follow us on Facebook “Droitwich Pamela May Community Trip Boat”. For a minimum donation of £10 per year you will receive three copies of Wych Waterways magazine keeping you up to date with the latest canal news and information. The trust is run and operated entirely by volunteers. 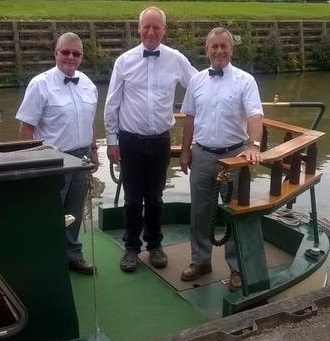 We welcome help with many tasks including, fundraising, administration, protecting and looking after the canal environment, maintenance of the boat and crewing. All crews are fully trained and help is available to become RYA qualified. If you book a trip with us we will store the data you give in electronic form and share it with our crew.